If you’re anything like me, you have at least one Pinterest board dedicated to all the amazing crafts that you’ll do ‘one day’ with your sprog(s). And if you’re anything like me, that day doesn’t come – mainly because setting up any of those crafts takes 3 times as long as the attention span of said sprog… meaning that half an hour of set up equals (if you’re lucky!) ten minutes playing time. However, I came across a craft this morning (here) and it was so easy and looked so interesting I had to give it a shot. And I think you’ll enjoy it too! It’s one of those sciencey types that are actually interesting – and the best part – it almost cleans itself up! So what exactly is this wonderful crafty thing? It’s called “the magical milk experiment”. 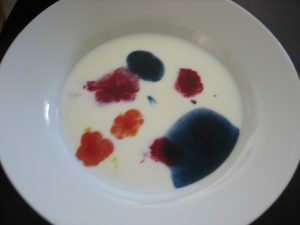 Basically, you take a white bowl, add enough milk to cover the bottom (about ½ cup), add a couple drops of different food colourants, then add a drop of dishwashing liquid soap. ng is it takes a surprisingly large amount of time for all the colours to mix completely. We used a toothpick to add the drop of dishwashing soap – this meant that Little Bear could put the stick in, take it out, see what happened – swirl it around – she had lots of fun. Truth be told, so did I! And the VERY BEST PART (sorry for shouting) is that this is cleaned up simply pouring the milk down the drain and rinsing the bowl. After all, there’s already soap in there!